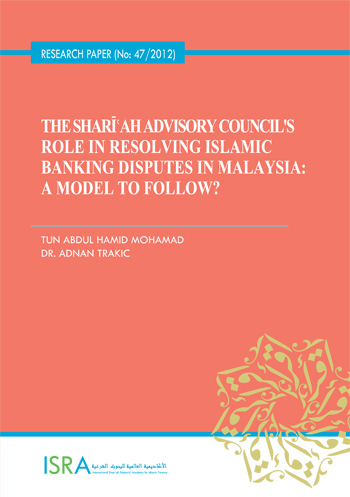 This research paper seeks to highlight the importance of the Shariah Advisory Council of the Central Bank of Malaysia (SAC) in the determination of Shari'ah issues in adjudicating Islamic banking disputes. Effective resolution of Islamic banking disputes requires the adjudication of both civil and Islamic law issues raised by the parties. Civil courts are well equipped only to adjudicate civil law issues whereas they lack competency to determine issues of Shari'ah compliance or non-compliance. In Malaysia, an attempt has been made to address the problem by the enactment of certain amendments in the Central Bank of Malaysia Act 1958 and subsequently enacting new provisions in the Central Bank of Malaysia Act 2009. The new provision makes it compulsory for the civil courts and arbitrators to refer Shari'ah issues to the SAC for determination. Even though challenges are being made against the provision, including on constitutional grounds, the provision seems to be working: to date, courts and arbitrators have already referred such issues to the SAC, and answers have been given and acted upon. The article proposes this model as a viable solution that could be adopted by other countries wishing to introduce or develop Islamic finance.